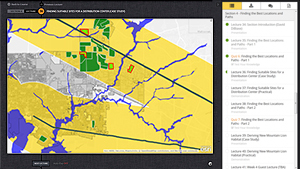 Case studies help students learn spatial analysis in ArcGIS Online. Massive Open Online Courses (MOOCs) have been an educational phenomenon in recent years. One thing that's remarkable about MOOCs is that they enable millions of people to explore new interests and strengthen skills without enrolling in formal degree or certificate programs. Now, to contribute to the growing body of MOOCs focused on geospatial technologies and methods, Esri is delighted to announce its first MOOC—Going Places with Spatial Analysis. Spatial analysis is what makes GIS most valuable to decision makers. Spatial analysis is the set of skills and techniques that professionals use to make sense of all kinds of data that can be displayed on maps—from business data to health data to environmental data to data that analysts use to respond to emergencies. Students in the free Going Places MOOC will get access to the full analytical capabilities of ArcGIS Online, Esri's cloud-based GIS platform. Weekly lessons will familiarize students with spatial analysis following five broad topics: understanding and comparing places, determining how places are related, finding the best locations and paths, detecting and quantifying patterns, and making predictions. Students will learn to use spatial analysis to make informed decisions in a variety of contexts—from land-use assessment to crime analysis to pollution modeling and environmental justice, and more. The course provides a conceptual framework that helps students understand the nature, as well as the practice, of spatial analysis. 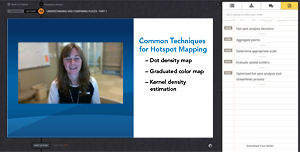 Going Places with Spatial Analysis is an intermediate-level online course for motivated people who know something about data analysis but want to learn more about the special capabilities of spatial data analysis. Previous experience with GIS software is helpful but not necessary for tech-savvy problem solvers. The course lasts six weeks and requires two to three hours of study per week. In addition to activities in ArcGIS Online, Going Places will consist of short video lectures, quizzes, case studies, and discussion. To provide this content, Esri has partnered with Udemy, which hosts online courses not just from universities but from all kinds of organizations, as well. To date, Udemy offers some 16,000 courses, which have enrolled about three million learners worldwide. The first offering of Going Places will launch in September 2014. It will be repeated as needed to satisfy demand. 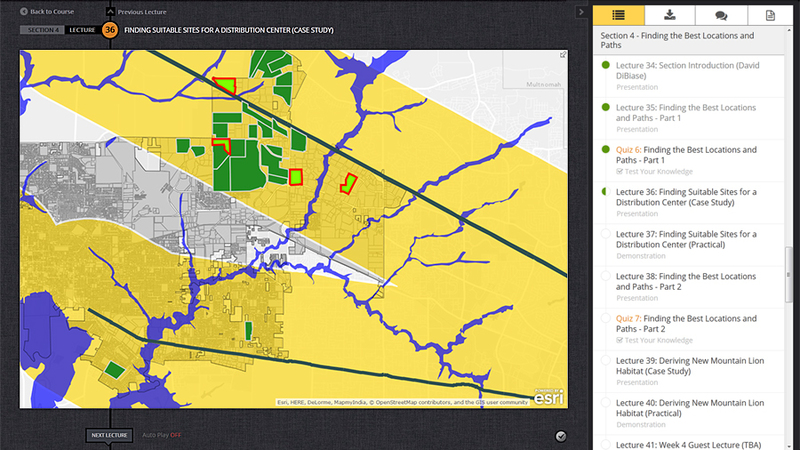 Expert Esri staff explain concepts and answer questions. Although the term MOOC was coined in 2008, the launch of three online courses at Stanford University in fall 2011 is often cited as the beginning of the MOOC movement. The first of those, Introduction Into AI, attracted 160,000 student enrollments. Two more open-access, unlimited enrollment Stanford courses soon followed. In 2012, the Stanford faculty members who offered these courses spun off private companies (Udacity and Coursera) to offer MOOCs in collaboration with select universities. As of this writing, over 7.5 million people have signed up for one or more of nearly 650 free online courses offered by more than 100 partner institutions through Coursera. The first MOOCs related to GIS appeared in 2013. The most massive of those was Penn State's five-week Coursera course Maps and the Geospatial Revolution, which attracted nearly 50,000 students. At Penn State's invitation, Esri was proud to help, suggesting student activities in ArcGIS Online and volunteering to serve as "community teaching assistants" to answer students' questions about the platform. One of the students' most frequent requests was for a second MOOC that presents more advanced topics and techniques. Esri's Going Places with Spatial Analysis fulfills this request by complementing MOOCs offered by Penn State and other educational institutions. Esri has been a pioneering provider of online and on-premises education and training for GIS professionals and students since 1997. Dozens of self-paced and instructor-led courses, training seminars, and workshops about various aspects of the ArcGIS platform are available at training.esri.com, many free of charge. Going Places is the first in a series of free online courses from Esri that are designed for the millions of learners worldwide for whom MOOCs provide a new way of expanding their horizons. Could you and your career go places with spatial analysis? 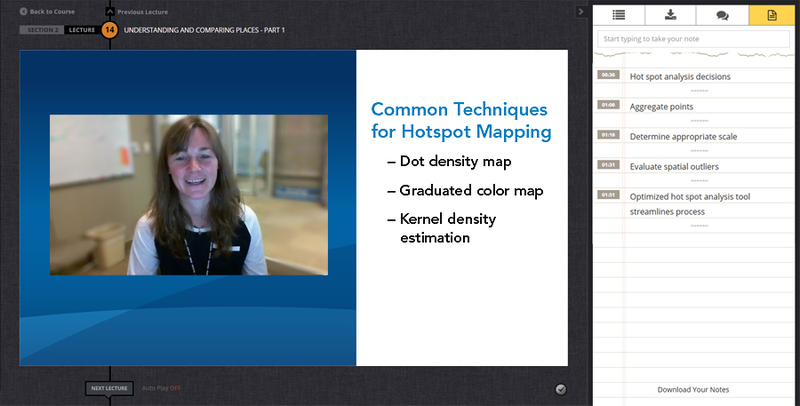 Visit esri.com/analyzemaps and sign up to be notified when the course opens for enrollment.